For over 600 years, every night a watchman has blown a trumpet from the top of the Notre-Dame Cathedral to signal that time hasn’t stopped on the shores of Lake Geneva. But even without him you’d certainly feel that the Swiss canton of Vaud is throbbing with life. This relatively small town, built on limestone slopes and in the crystal-clear Alpine environment, has the spirit of a great metropolis. Welcome to Lausanne. The best of all Swiss restaurants. – Excellent jazz cellar in a historical basement with vaults and fantastic acoustics. All styles and eras are performed in an incredibly cheerful and unfettered environment. – Traditional city warehouse in the center with a wide assortment, but with its own style. It offers something extra, especially in its grocery department. Croisi`ere with Lausanne steam-navigation from Ouchy to Montreux and back on the Geneva lake. An amazing panorama with a view of Lavaux region’s terraced vineyards and villages like Lutry, Villette, Riex, and Epesses – as well as the steepest (45°) vineyard Grand Cru Dézaley between Lausanne and Vevey. 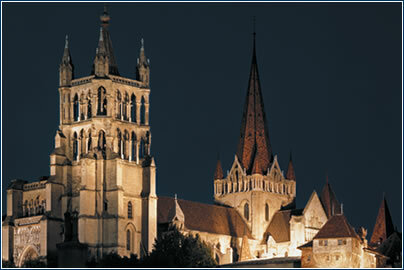 The Lausanne Cathedral from the UNESCO world monuments list is built in a late-Gothic style. A bellman walks up on the tower and blows a horn at midnight, announcing the hour and wishing a peaceful night to all people of good will. Visit the vineyards you can see from the boat. Take a break in Epesses village and taste wine in Caveau des Vignerons, or ring the bell by the wine-grower on whose door you see the “Vigneron Encaveur” sign (wine-grower-sommelier), and taste some excellent white Chasselas wine. On the shore of the lake by the harbor in Ouchy district. Don’t forget to ask for a room with a view of the lake. Gourmet Restaurant that is not yet that famous. … If you are looking for a good bar. Everyone interested in art should visit the incomparable Art Brut Collection while in Lausanne – as well as the Hermitage Foundation collections.www.artbrut.ch, www.fondation-hermitage.ch. Probably the best view of Lake Geneva is from the Olympic Museum garden. Go to the first terrace and relax. I recommend taking a ride to the upper subway station – which reminds me rather of our funicular on Petřín – and from there to continue up to the cathedral. Then descend to the lake, where there is a lot to see and many places where you can refresh. While at the lake, try some of the regional fish specialities. Very luxurious hotel just in front of Lake Geneva and the Ouchy Promenade. – Elegant and fashionable restaurant, situated in the trendy area of the Flon, where you can enjoy top French cuisine and probably meet some international stars. The world famous club which hosts the best international DJ’s and artists. Globus center – Next to the Place de la Palud in the old town. Beautiful fashion boutiques and souvenirs. Downhill on roller-skates from Epalinges to Ouchy along the lake and then a boat trip with a “pedalo”. A must. Summer Jazz festival of Cully and the Folk and Pop festival of Nyon in July. www.MySwitzerland.com – touristic portal about Switzerland with useful information on certain regions – with a Czech version. www.lake-geneva-region.ch – well-arranged web devoted to Lake Geneva region, including tips for accommodation, entertainment or trips in the surroundings. www.olympic.org – official web page of the Olympic games, with info about the Olympic museum in Lausanne. 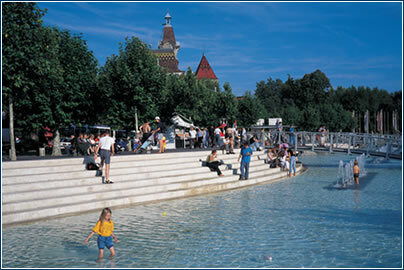 www.lausanne-tourisme.ch – comprehensive web page of Lausanne Tourisme. · There are 22 museums in Lausanne. The Art Brut collection, presenting works created e.g. by prisoners and psychiatric patients, is exceptional. The Canton Archeological and Historical Museum offers a cross-section of the region’s history, and the Swiss Film Library, maintaining a collection of 40,000 films, is one of the most important film institutions in the world. · Definitely don’t forget to explore the region’s countryside. The 35-meter Sauvabelin lookout tower, built from recycled materials, offers outstanding views of Lake Geneva. 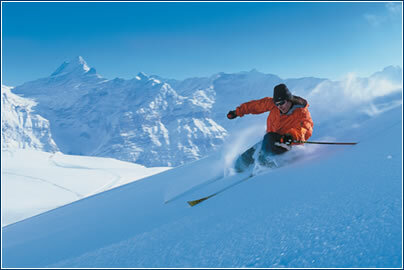 A ten-hour tour takes you to Zermatt, the general access point for climbing the Matterhorn. A funicular excursion to the Diablerets glacier is wonderful. · Lausanne is the seat of the famed Béjart ballet and other dance ensembles. From June to August the town hosts many cultural festivals, you can see around 300 performances. But culture doesn’t end in the off-season, and there is always something to choose from. · The International Olympic Committee has been headquartered here since 1915, and Lausanne has been the official Olympics capital since 1994. The Olympics Museum offers a unique view of the lake, and not far from the entrance stands a statue of Emil Zátopek. 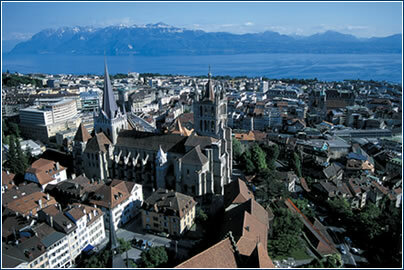 · Lausanne’s surrounding area is dotted with medieval fortresses and castles that can be reached by bus in 20-60 minutes. Chillon castle, built on a rocky island in the lake, and Aigle castle, from the 13th century, are worth seeing. · Lausanne’s night life is enlivened by dozens of pubs, bars, discos, and clubs. This is partially due to its status as a student town. The local university dates back to 1537, and today it attracts hundreds of foreign students.